What happens when deployed soldiers lose battery charge during a life-threatening situation? There are no wall outlets in the field or in remote areas, which reduces access to reliable electricity. Luckily, engineers from the Command, Power and Integration Directorate (CP&I) within the Army’s Communications-Electronics Research, Development and Engineering Center (CERDEC), are working to develop interoperable power solutions, while reducing soldier power burden and enabling energy independence. Solar Power: These are not the JanSport backpacks of your high school days. 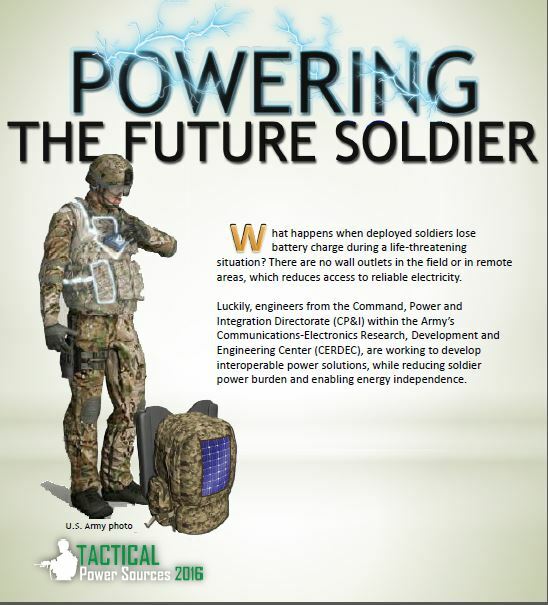 Engineers at the Command, Power and Integration Directorate (CP&I) are trialing solar cells on soldier’s backpacks, making for a new way of collecting some rays. The power capabilities cells could be deployed on large ground mats and large vehicle-borne solar arrays as well. Wind Power: Instead of wind turbines planted in a wheat field in middle America, these deployable masts are made of lightweight carbon fiber technology containing a wind power system that is light enough for soldiers to carry. The masts reach up to 30 feet in the air and drive the batteries for energy storage. 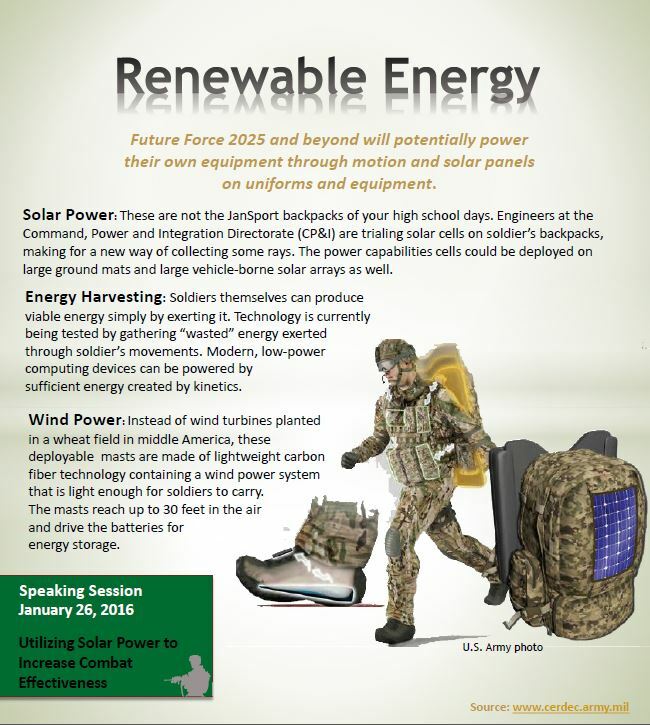 Energy Harvesting: Soldiers themselves can produce viable energy simply by exerting it. Technology is currently being tested by gathering “wasted” energy exerted through soldier’s movements. Modern, low-power computing devices can be powered by sufficient energy created by kinetics. Vehicle Recharge: The less energy exerted to achieve a charge, the better. 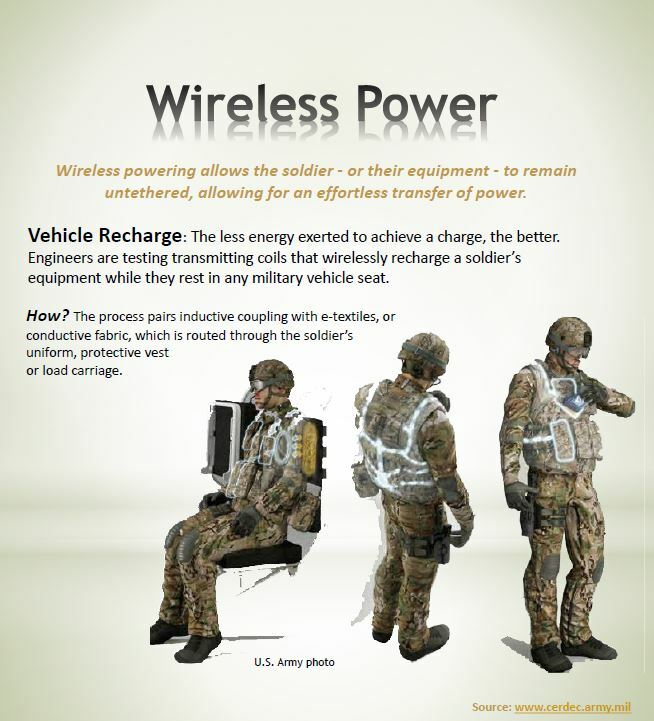 Engineers are testing transmitting coils that wirelessly recharge a soldier’s equipment while they rest in any military vehicle seat. How? 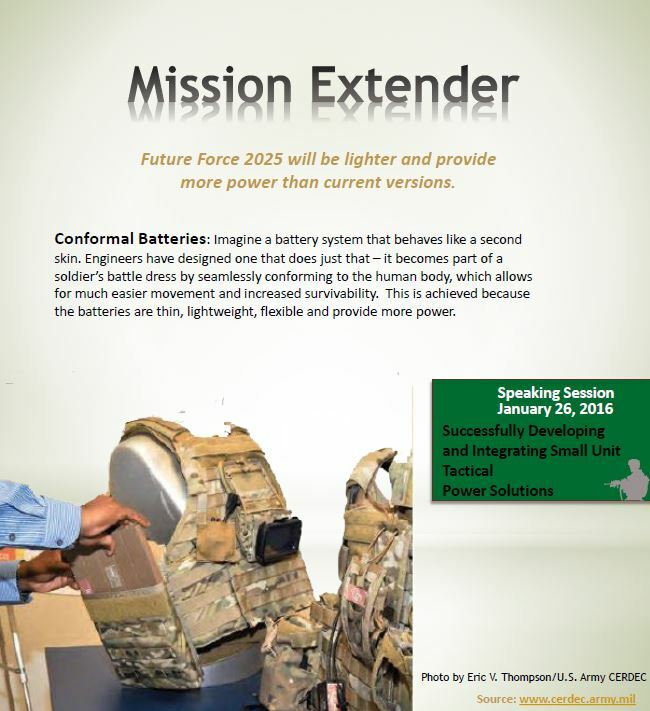 The process pairs inductive coupling with e-textiles, or conductive fabric, which is routed through the soldier’s uniform, protective vest or load carriage. Conformal Batteries: Imagine a battery system that behaves like a second skin. Engineers have designed one that does just that – it becomes part of a soldier’s battle dress by seamlessly conforming to the human body, which allows for much easier movement and increased survivability. This is achieved because the batteries are thin, lightweight, flexible and provide more power.